What Randy’s business offers is a safe, economical alternative to chain link fencing. His product, Hidden Fence, is 99.2 percent effective at training a dog to respect the boundaries of a yard. Not to mention Hidden Fence can save pet owners $1,000’s compared to wood or metal fence installation. With Hidden Fence, the dog is fit with a collar which emits a warning sound when the animal wanders too close to the boundaries specified at installation. If the animal continues towards the boundaries the collar delivers a mild corrective stimulation. “Depending on the dog, you are talking about two to four weeks for training. Once they hear that warning tone that is all it takes,” said Badour, who uses Hidden Fence to keep his dog, Kramer, from terrorizing the neighbors. Hidden Fence’s collar interacts with a boundary of wire installed into the ground. The process of setting up the wire takes between two and four hours. Badour and his crew slice open the ground in order to thread Hidden Fence across the yard. The grass makes a complete recovery within days of installation. “We’re a local business. I think we offer a little more personal touch for the customer. We’re available when the customer calls and we’re there the same day doing whatever they need, from any problems they have with the system to training their dog,” said Badour. All of Badour’s packages include up to one acre of Hidden Fence wiring. As well as keeping pets in the yard, SafeBet also offers solutions inside the home, in the form of small battery powered units which will safeguard anything from a garbage can or toilet bowl to a computer room. “If you have something in the house you want to keep the cat away from, these will do the trick,” said Badour. available for purchase online at https://michiganhiddenfence.com. Discipline for a dog is one thing, Badour has pet owners in mind with the newest addition to the Safe Bet stable. Now, anyone who owns a goldfish, parakeet, cat, dog or any other house pet can go SafeBet Hidden Fencing’s website and purchase everything from food to collars. “Order what you want, and it’s delivered right to your door,” said Badour. Customers can either make a one-time purchase or schedule regular deliveries of a wide array of high-quality products. People are so busy now they don’t want to mess with buying pet food. Whatever they need just comes automatically and they don’t even have to think about it,” said Badour. https://michiganhiddenfence.com to set up an installation time. 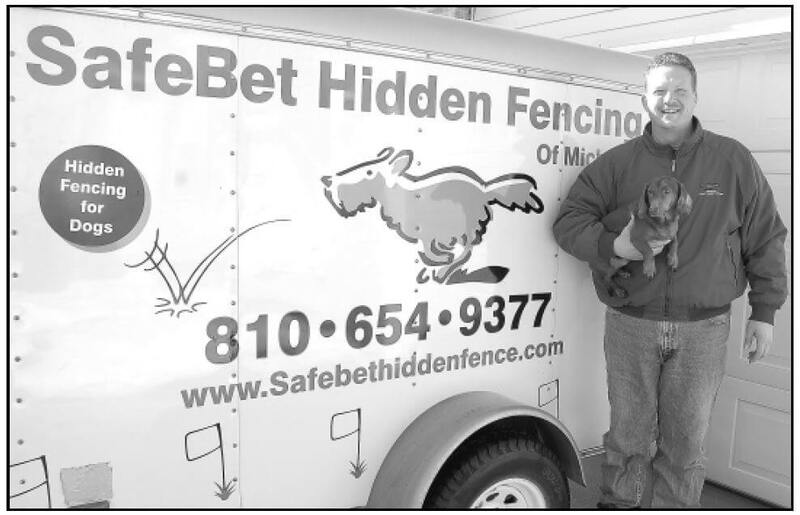 Our hidden fencing can save you hundred’s, even thousands of dollars compared to the Invisible Fence® brand, Pet Stop, Dogwatch, Dog Guard, and other hidden & Invisible® Fence dealers in Michigan.